Dropping your kid off at college this year? It’s hard. I was like a deer in headlights the month leading up to my first drop off. My second one is in three days and I am here to tell you, I am handling it only slightly better than the last one. Managing the little details feels overwhelming. Trying to help my son pack takes every ounce of energy I have. Doing it means it’s real and that I will be on a plane flying 3,000 miles across country in a few days and then flying home alone. I need everything simplified. I need to not think and I suspect you are feeling the same. Every time I visit my sons at college I do a grocery store run. I do my best to try and provide as many healthy options as possible for them. They are not getting enough sleep and are pushing themselves hard. Providing fruits, vegetables and getting them to drink plenty of water are key components to keeping them healthy during the college year. This is the list of items I buy each time. Print it out and take it with you. It will make stocking their dorm room less of a chore and will be one less thing for you to think about! Click HERE for a free printable of the list below! And the most important drink of all? Water, of course. The best way to serve up water? The Brita Space Saver Pitcher. Kids need lots of water. The last thing they need to be spending their money on is a bunch of plastic bottles that become landfill. Instead buy them a Brita Space Saver Pitcher. Filtering water has never been easier and is a great way to start healthy habits throughout the school year. The bottles are BPA-free, hold six eight ounce glasses of water and filter chlorine taste and odor, zinc, and harmful contaminants copper, mercury and cadmium. 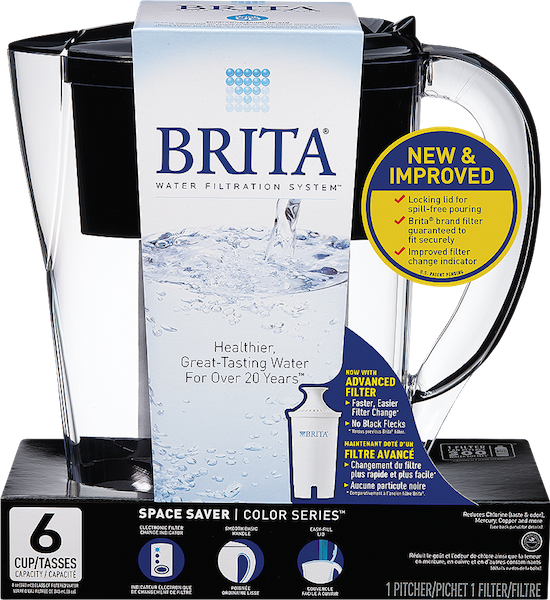 The Brita Space Saver Pitcher is available at Target. Save 10% with the Target Cartwheel App and if you sign up for the Brita filters on Target subscribe & save, you save 5% and the filters can be sent directly to your student at school! One less thing for you to have to think about. I am also a big fan of the Brita on the go bottle as my son is an athlete and is always on the field! Getting your kids off to college is one of the hardest things you will do as a mom. You will spend a lot of time worrying about them, especially their freshman year. Knowing you are providing them with healthy eating options and plenty of water to keep them hydrated will ease some of that worry. To ease your worries further, I highly recommend texting them the first few months in the morning just to say good morning. It’s simple. They know you care and you know when they respond that they are safe. !